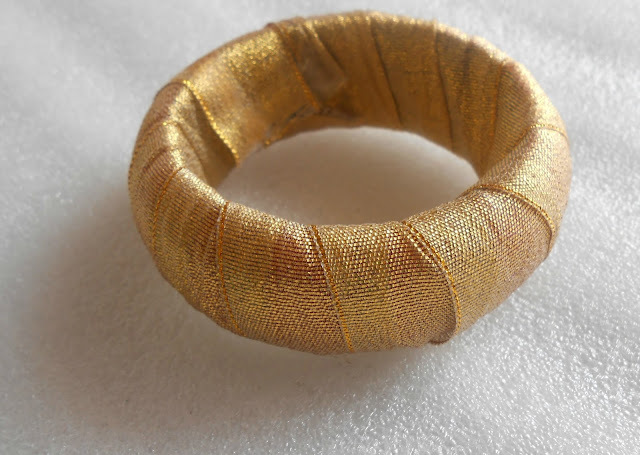 Sriz Beauty Blog: Give Your Old Bangles A Makeover!!! Give your old and used bangles a brand new look with easily available items at home. Many of us have a lot of old,excessively used, faded; out dated bangles in our collection. We can neither use them nor throw them! So, we can give this old bangles a makeover with the decorative ribbons which are lying in the corner of a cupboard!!! Dig them out to craft your old bangles. Things required for the Makeover: We need only 4 things for this!!! 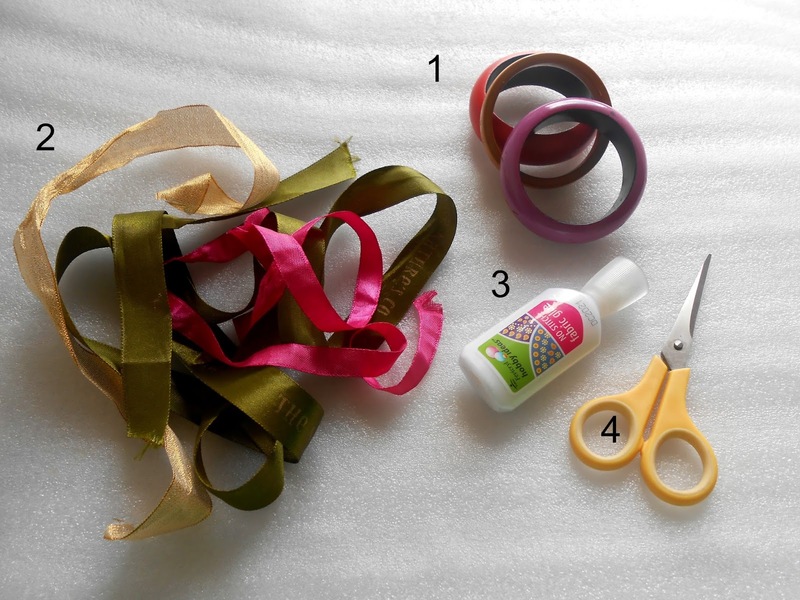 4) Scissors - to cut the edges of ribbons. 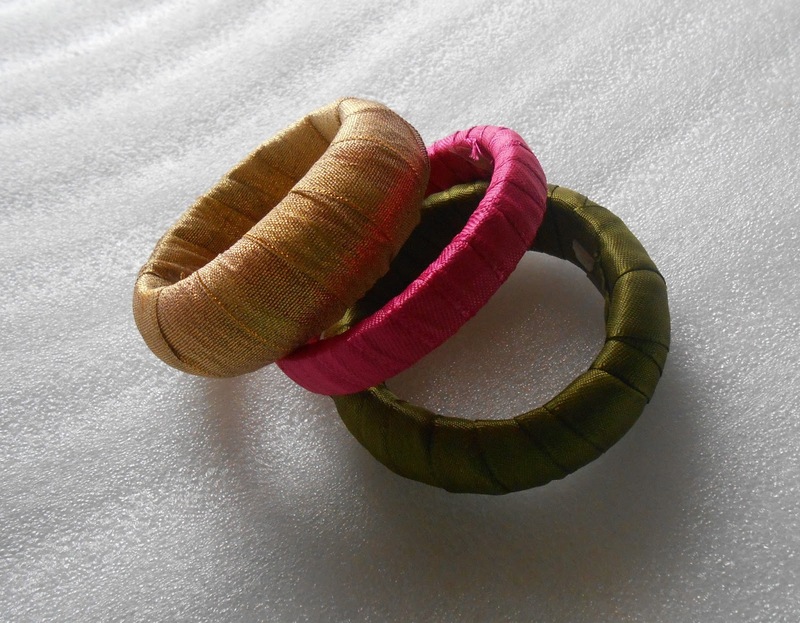 Step 1: Choose different colored ribbons to each bangle. 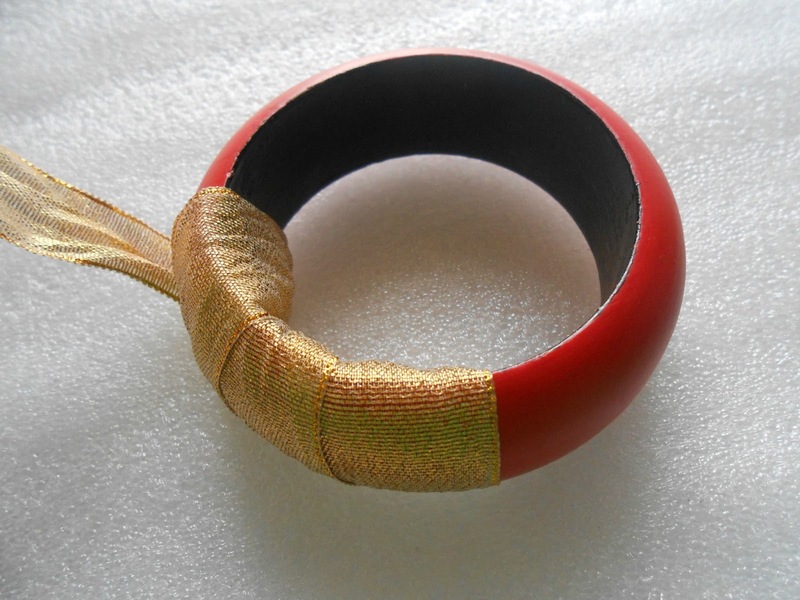 I have selected a golden shimmery translucent ribbon to the red bangle, as the red color of the bangle gives a nice contrasting shade from inside to the golden ribbon. 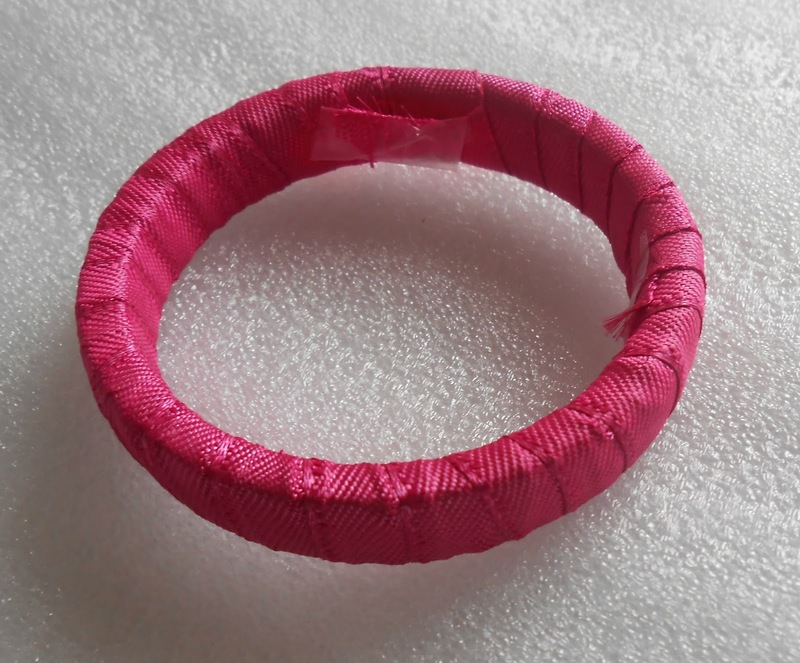 And dark green color ribbon to the lavender bangle and thin pink ribbon to thin bangle. So, that they match perfectly. 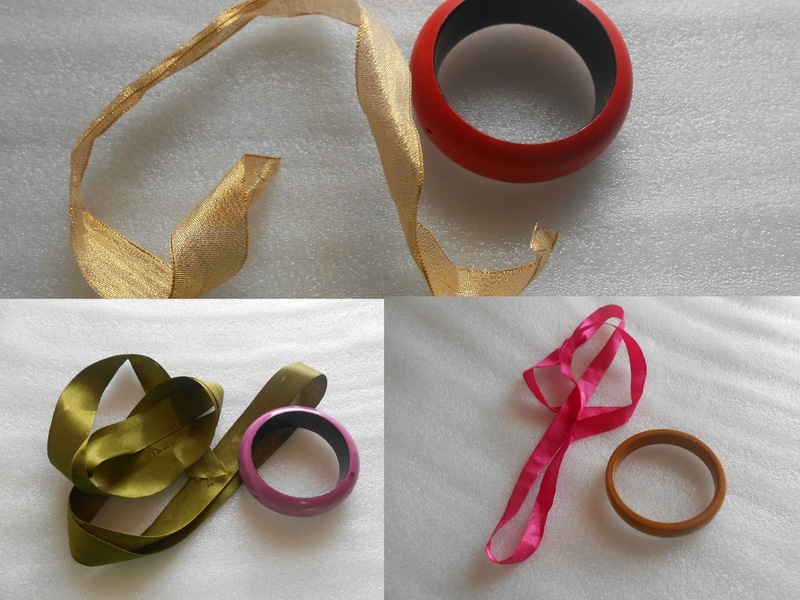 Step 2: Cut the ribbons, length wise as per the size of the bangles. Trim the edges nicely to give a clean look. Step 3: Apply Glue on one spot on the inner side of the bangle, where you need to stick one edge of the ribbon and stat wrapping the ribbon in clock wise direction. Step 4: Finally seal the other edge of the ribbon with the glue. 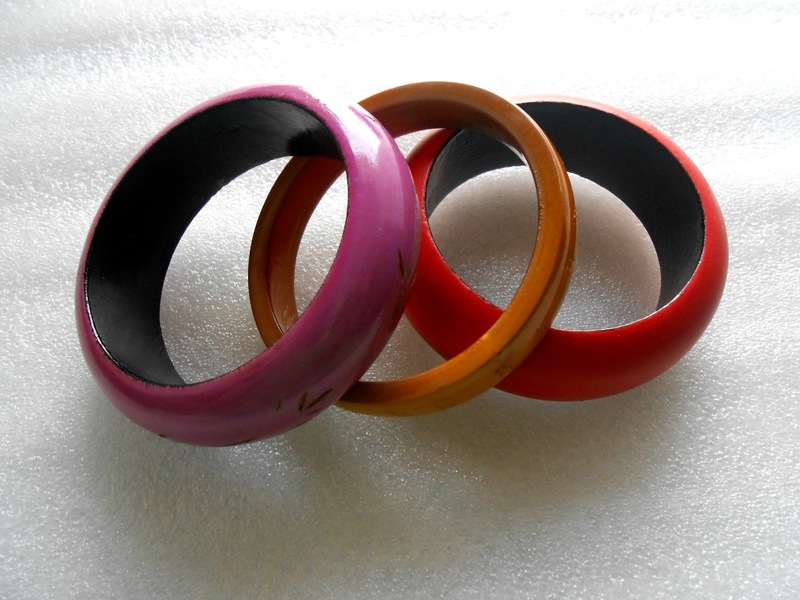 Repeat the same procedure for the other bangles too.That's it!!! So, this is the final look of the bangles!!! Aren't these gorgeous??? You can even add some kundans or stones or tiny appliques to add some more gorgeousness to the bangles. Even you can use different colored threads and wrap them in a similar way, but it takes little more time and needs a bit of patience. This is how you can give your old bangles a makeover with simple ribbons!!! I love arts and crafts very much and love to try experiment in different things at home. Whenever I have some leisure time, I use it to craft some new items at home. I browse for new home crafting ideas on the net and few months back I came across the crafts section in the Rewardme.in, where I found a number of home crafting ideas, D.I.Y crafts and many more. I loved every article in it. 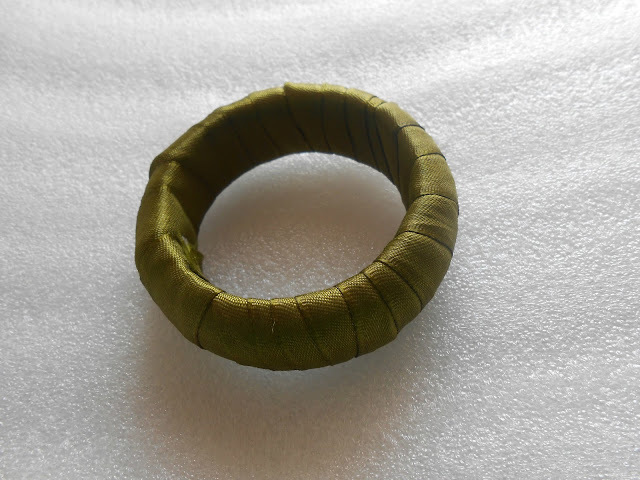 I have tried few crafts from the site at home like the art of dry brushing; sew fast, so easy -make a cushion, make a mirror, wrap the odd and obvious and many more, which turned out very well! If you love to spend your leisure time meaning fully then do try out some crafting ideas on Rewardme.in !!! I am participating in the ‘Ready For Rewards’ activity for Rewardme in association with BlogAdda.